Do you believe in earthly angels? After the experience I had today I most certainly DO! This patriotic beauty (on loan from my mom) has been my ride around town this past week because Mike sold our jeep. We've been wanting to sell the jeep for a while and finally decided to list it. We thought we'd have a little time to look for something before it sold, but it sold faster than we expected, which means I'm without a car until we can find something else. So I've been beating these bike pedals into the ground to get myself around town and have actually really enjoyed it! Well, today I needed to go to the grocery store to get some milk and a few other random things. 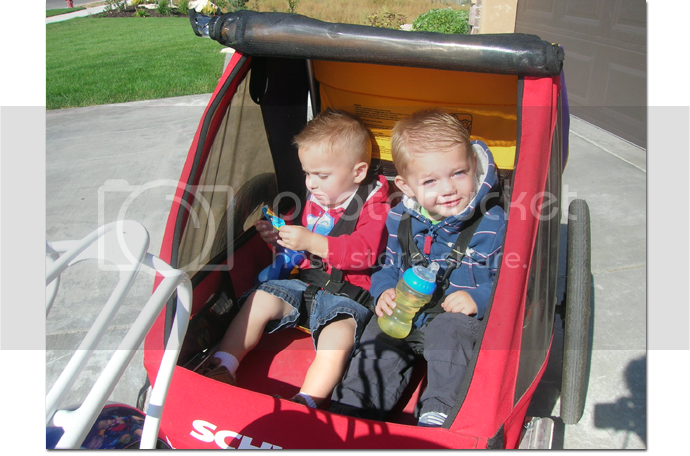 I was also babysitting my nephew Brock, so I strapped the two of them into the bike trailer and we set off! We made it to the store safely and purchased our goods but as we walked out and I was strapping the boys back into their seats, I noticed the left tire of the trailer was FLAT! Grrr. I started thinking to myself that we could probably [barely] make it home with one flat tire when a customer came out of the store and pointed out that the other trailer tire was flat as well! Double Grrr! So now I'm thinking, what on earth am I going to do? I was maybe 3-4 miles away from home and there was no way I could walk home with two hungry toddlers that needed naps, a bag of groceries and two gallons of milk (which needed to be refrigerated ASAP). So I called Mike at work and he offered to call around to people in the ward in hopes of finding someone home with a truck that could come and pick me up. I'm thinking that most people who drive trucks are men and most men work during the day, so I was pretty sure our chances of finding someone home with a truck to come and rescue me were probably slim to none. While I waited to hear back from Mike, the cutest old man wearing overalls and a straw cowboy hat walked out of the store and started talking to me. We talked for a few minutes and then he took his groceries to his car. When he walked his shopping cart back up to the entrance of the store by where I was standing, he stopped to talk to me some more! We talked about my bike and the flat tires and how Bryson and Brock are adopted. We talked about my mission in Ohio and how beautiful it is there and how I went to BYU and majored in dietetics. He told me about his farm in Kentucky and how he went to BYU back in 1950 as a non-member and then shared with me his conversion story. He also told me about how he met his wife and how she passed away three years ago. He was the most interesting and inspiring man and was such a pleasure to visit with. He kept me company for about 20 minutes and completely kept my mind off of the frustrating situation I was in. He was certainly an angel sent from heaven and I was so grateful for his kindness to me at a moment I needed it most. Then my phone rang. I was expecting it to be Mike with word about help coming but it was my dad! He asked where I was and I told him that I was stranded at the grocery store with two flat tires. He said that they had just arrived at my house and could come and help me! I was absolutely amazed! What makes it so amazing is that my dad should have been at work, but happened to have the day off because of parent teacher conferences (he's a high school teacher). My parents usually drive their little Mini Cooper, which wouldn't have been able to fit the bike and trailer, but for some reason they drove their truck. They rarely stop by unannounced in the middle of the day, but they miraculously did! All of it was beyond amazing--and the timing couldn't have been more perfect! When I saw my dad pull into the grocery store parking lot a few minutes later, I felt like he was an angel sent to me from Heaven and knew that Heavenly Father loved me and was watching out for me. We loaded the bike, bike trailer, and my groceries into the back of the truck and then loaded the boys into the two little jump seats in the back seat (very unsafe I know, but it was our only option) and headed home. When we got home, I asked my mom, who had waited behind, why they decided to stop by so randomly. 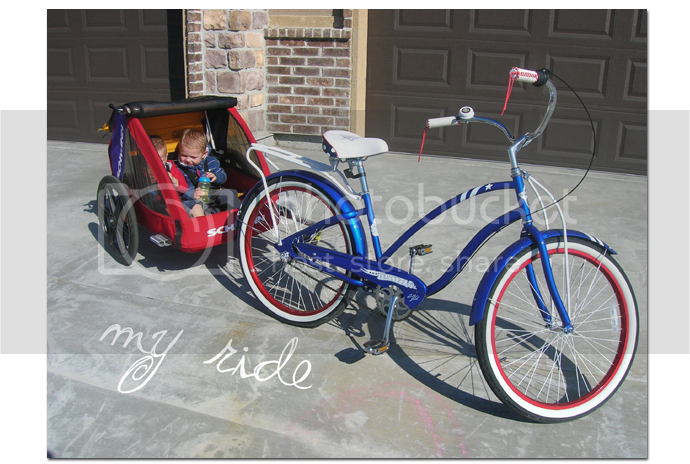 She said it was because she was at home and suddenly felt like riding her bike (which I had), so they got in their truck and drove all the way out to my house so she could ride it. Kind of random don't you think? 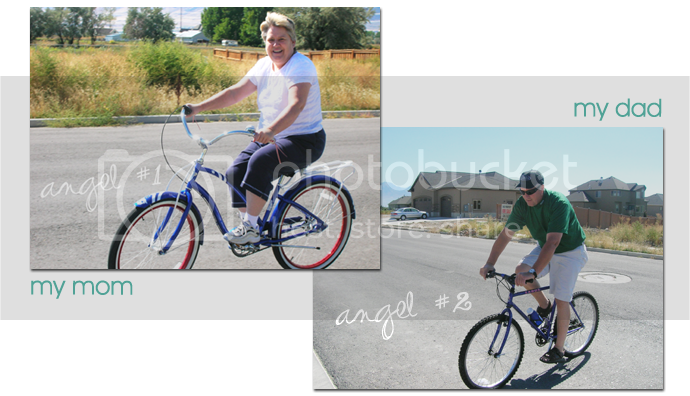 They brought my dad's bike with them so he could ride with her when they got here, which is why they had the truck instead of the Mini. My mom and dad thought they were just coming here to ride their bikes, but it turned out the real reason they came was to help me. Thanks so much mom and dad!